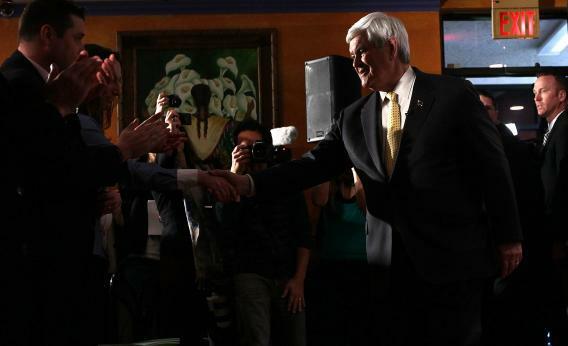 MANCHESTER, N.H. – Forgetting the Occupy distraction, and forgetting the Hispanic outreach theme of the event, reporters showed up for Newt Gingrich’s event here for one big reason: The next act of the Get Romney show. Gingrich played along, using his press availability afterward to deride Romney on every bullet point on his CV. “I first worked with Ronald Reagan in 1974,” said Gingrich. “I worked with Reagan in the 1980s, when Mitt Romney was an independent. I worked to re-elect George H.W. Bush in 1992, when Mitt Romney was voting in the Democratic primary for Paul Tsongas. I was helping author the Contract With America in 1994, when Mitt Romney was runnin to the left of Teddy Kennedy and opposing the Contract With America. I think you can look at our career, and the two parallel timelines, and the gap between a Massachusetts moderate and a Reagan conservative are very clear.” Point being, it’s not negative to say any of this. “Bain Capital acquired a company, in essence looted it, and then laid off 1,700 people,” he said. That wasn’t negative, either. Just facts. We are miles and miles away from the debate halls where Gingrich attacked “my one opponent, Barack Obama.” Ron Paul, who’s avoided some of Gingrich’s negative press attention simply by never making any pretensions of positivity, spent his last 24 hours talking the same talk. The difference is that Gingrich will move to the South, and Paul’s team is already looking at the next, under-discussed, under-organized caucus states.